Has any political party shown a candidate who even admits these problems exist, much less offered solutions? The DC Beltway is oddly shaped like a toilet seat. A toilet all parties have taken a dump in for years, but no one has bothered to flush. A horse thief stole a cowboy’s ability to survive. Lenders do the same. Banker supported politicians write laws hiding the crimes. Contracts are cleverly written so the debt is not paid off until the end of the contract. Any interruption in life, health, layoff, accident, or market shift, enables the lender to take all collateral with no obligation to return any equity earned. Abusive bureaucrats do the same, enforcing the letter of the law with an iron fist, showing no human consideration in enforcement, oblivious to the harm and suffering they cause. The Federal Reserve act was implemented in 1913. Income tax was also enacted to pay the interest on the debt created. A never ending circle. Can IRS be explained? It does not build highways. It entirely pays banker interest, nothing else. We need to return to constitutional money. No interest to bankers. The infinite creation of money meant ANY banker could now re-finance ANYONE at ANYTIME. The banker lost nothing. The money lent was fictitious to begin with. But bankers don’t, choosing to repossess rather than give 2nd opportunities to victims of circumstances. IRS has become a thug organization threatening the wealth and health of political enemies of whatever administration is in power. That must stop. IRS serves no sane purpose to exist. Enact the Tax Retirement Fund policy proposed by Walter Burien. Proper INVESTMENT of government assets can provide all revenue necessary to operate government. The Bush administration hid massive information about 9/11. Why has he and his administration never been called on the carpet to explain the numerous inconsistencies? Why did he introduce a Nazi organization into the American culture called Department of Homeland Security? Why did he appoint a dual citizen to administrate it? Why did he then put it over control of the Department of Defense. Again, run by a dual citizen, Michael Chertoff. This is pure treason and destroyed whatever national security we may have had. Eliminate the Department of Homeland Security. Return the Department of Defense. Stop all dual citizenship from any US Government employment. Why has the Department of Energy not replaced the polluting industries of coal, oil and nuclear with clean alternatives? Nuclear remediation has been known about since the mid 90’s, but the physicist who invented the process was removed by political means by the corrupt Nuclear Regulatory Commission. Is America administered by the US Constitution, or is it a corporation following a mysterious Charter since 1871? If it is the latter, what government entity issued the Charter? And why have the articles of its incorporation never been taught in schools? If the US Constitution is still the authority, why don’t people in power positions follow it? Why the dual standard allowing banks who launder hundreds of millions of drug money, to just get fines, but dropping the hammer on small users? Drug use is a medical problem. Drug promotion is a banker problem. Fine print on new cell phones, express health dangers. Why is this legal avoidance of responsibility allowed? If cell phone radiation is hazardous, why not make it public? Why does major media only cover has beens? Because they want to milk the last dime of advertising revenue from past efforts. And no newcomer has the revenue to buy as much media attention as a Kardashian. Why has media ignored all the Crimes committed by Bill Clinton? George Bush? Obama? Hazardous side effects of vaccines are ignored by candidates and media alike. Monsanto appears to own both media and all candidates. No mention of GMO hazards come to light. Why are whistle blowers chased down like rats, but criminal bankers, and politicians who hide them enjoy their mansions and private jets? Why is any dual citizenship allowed for any position in US government? Can’t they find work elsewhere? No, because private industry requires honest performance to justify a paycheck, unlike government. Credit reporting or gossipers? Vindictive or supportive? Warmongers belong in the front line. 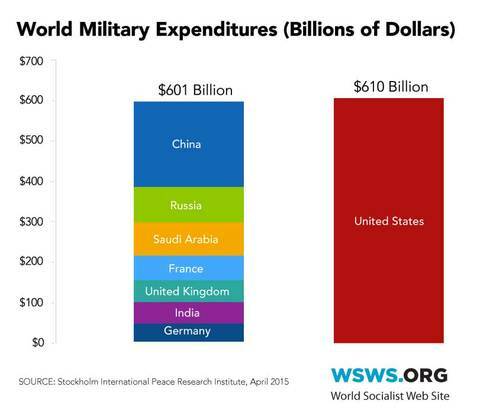 American military spending is as bad as Russia during the cold war. Fukushima radiation must be addressed. Investigative reporter and former NSA technician himself reports placement of both Stuxnet and micro nuke explosives was done by Mossad. Why does America do anything with that criminal organization? Why is Netanyahu allowed on American soil with his support of acts like this that threaten the lives of innocent parties. Why does America support Israel at all? Claim of an everlasting land grant to a particular race is the result of horrific biblical scholarship and blatant racism. It violates basic Christianity and also offends every other religion on the planet. Review ANY secret society membership. Divulge and register. Disallow those proven to violent behavior. Instant judgments? How does law enforcement know the cause of anything by the 6:00 news? How does a drone flying at altitude, know the identity of everyone they are about to kill? Stop all predator drones. Forbid ignorant “statements” from law enforcement, without proof. Fire any who ignore this. Abuse of power issues. Anyone convicted of abuse of power in any government position needs to be held personally responsible and denied any possibility of future employment in any government position. Who controls all security clearances? Why is criminal activity hidden within them? Who is allowing this? Is critical Government communication routed through an onion router? Why? Who is policing any possible rerouting of critical information? Who issued the SERCO corporate charter? Why is ANY private corporation allowed to control such highly sensitive government information? Only elected government should hire individuals to work in such sensitive areas. If Government monitors anything done by a US Citizen, that citizen should be able to see what is being monitored at any time without a complicated court order. If the citizen loses something, and NSA has a copy, it should be provided free of charge to the person who lost it, as a benefit of being a taxpayer. Money should always be proportional to the population. Government should return to issuing constitutional money, and regulate it to population growth. Moderate gold backing should be established for international stability, but not for circulation. Government operations are to be covered by the Tax Retirement Fund promoted by Walter Burien, mentioned elsewhere in this article. All foundations are tax scams. Even churches survived without the 501c3 category before it was implemented as a way to stifle their political voice. No foundation properly helps those who need it. Cancer foundations are the most obvious fraud. How many years, how many dollars? But cancer continues to take more victims every year. Eliminate both foundations and religious exemptions. Let donations cover all costs, not hide tax liability for the wealthy. Eliminate ALL income tax to begin with. Make donations mean something. Eliminate Corporate Income Tax also. Establish a proportional payout of earnings to shareholders and general employees. CEO payroll multiples over 150 times that of an entrance worker is insane and criminal. If he wants more, he should just buy company stock and enjoy the same dividends paid to all other stock holders. Tariffs supported the country for years. Let’s return to that, along with the Tax Retirement Fund program proposed by Walter Burien who will use true CAFR accounting to produce ample wealth to eliminate all other taxes. Let everyone keep what they earn, and freely give help where ever they desire, without government bending their motivation. What candidate in any party has addressed ALL these topics? None. If they are on the ballot, they are on the take by someone with a lot of money they likely stole from YOU. If their name is on the ballot, they aren’t worth a vote. Either write in a name you know you can trust or don’t waste a vote for someone who will lie to you. If you don’t know how to write, you are not qualified to vote. You are currently browsing the energyblog blog archives for May, 2015.